The Wells Fargo scandal, which involved employees opening fraudulent accounts for customers to meet intense pressure to meet sales quotas, is just one recent example of ethical failure in business. Unfortunately, these large-scale ethical disasters have left the public jaded and mistrustful. The uplifting news, however, is that a counter-culture of corporate social responsibility and a renewed commitment to company ethics has taken on a life of its own. Most business professionals like to think they would never steal, accept a bribe, or act in another inappropriate manner if given the opportunity. These same people can also find the promise of an attractive financial incentive to meet a specific target too much to resist. The Wells Fargo crisis is a perfect example of this. A second common problem is that conflicts of interest can arise that no one ever realized could happen. One situation where this is more likely to occur is when companies change too quickly from the top down. An executive suddenly charged with leading a merger and acquisition or hostile takeover, for example, could find himself or herself in a position to take bribes to ensure the outcome turns out in favor of the other party. Yet another potentially unseen ethical dilemma a few decades ago that is commonplace today is the problem of cross-cultural interactions. Workers on opposite sides of the globe will naturally do things differently. When their cultures collide, who is right and who is wrong? One person paying off the other to let his or her culture win can be an unfortunate outcome of this scenario. 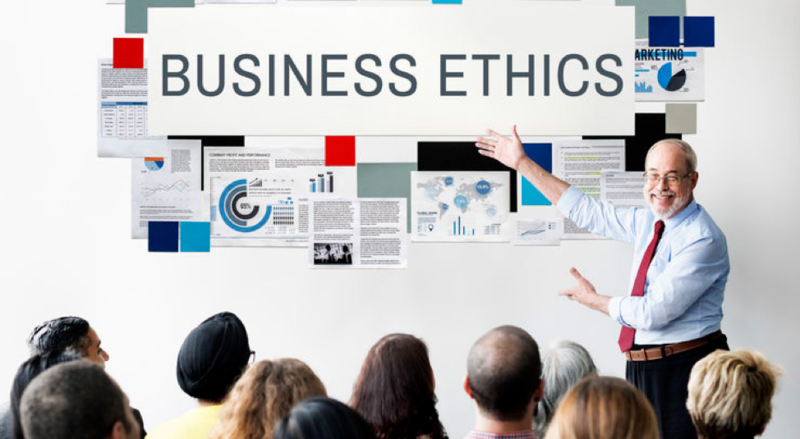 While no one can change how another person or even entire corporate cultures behave, they can make it clear they intend to act ethically by displaying some of the actions below. Respect the privacy of co-workers: Everyone has the right to keep their personal life separate from their life at work. That means others should never eavesdrop, go through files they have no business need to see, or gossip about anyone. Refuse to take credit for someone else’s work: Most people enjoy special acknowledgement from the boss for an innovative idea or a job well done. Even so, bosses can sometimes credit the wrong person. An ethical employee will deflect the praise to the person who rightfully deserves it. Be welcoming and inclusive: Although everyone was a newcomer on the job at some point, they seem to forget how it felt. Treating new people with kindness and helping when needed is the morally correct thing to do. This also goes for including co-workers from all backgrounds and skill levels in social situations when the opportunity arises. Any person or business can face great temptation to act in a greedy manner rather than one than benefits the larger society. Those tempted to do so should look towards Target, the discount retail chain that donates five percent of its profits every week to worthwhile causes. Part of corporate social responsibility for companies is considering how they can impact the larger society for good rather than focus only on profits. This is sure to capture the attention of potential customers, employees, and investors as well.